Nick Hayes: Where do marketing depts. get their steer from? 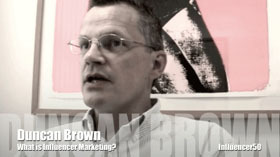 Nick Hayes: How has Influencer Marketing been hijacked by Social Media Vendors? – and how can it get back its link to Sales? John Owrid: The world of social media relies on self-importance as establishment recognition grows. Click image to view two-minute video. If you're employed on the vendor-side of the industry you might like to join the vendor-only LinkedIn Group - Influencer Marketing & Influencer Relations. Now with over 800 vendor-side members.